This follows up my post on itsudemo, where I explained why this should be read as “anytime” (as in, “at any time”) from a few points of view. You’ll see why below. It was inspired by a little slice of anime. 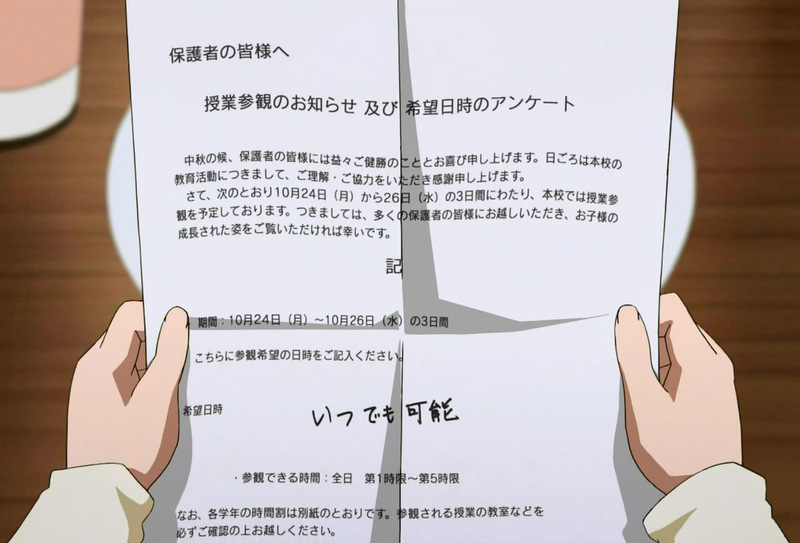 The girl in this anime (Persona 4, incidentally), a cute 9 year old named Nanako, received a notice/survey from her school. The school was holding an open classroom for parents to come see how their children are being educated, anytime between 1pm and 5pm on the indicated day. This was a big deal to Nanako, because she felt like her father was becoming an increasingly remote part of her life. It wasn’t so simple; her father was a police detective who couldn’t let go of Nanako’s mother’s having been killed by a hit and run driver who remained at large, a cold case with little prospect of resolution. Of course, what wasn’t good was the father becoming ever more remote. There’s something of a family crisis and finally, her father, who was the one in the wrong here, signed the form as above. Being this cute is criminal. Your dad's gonna arrest you, Nanako. So yes, she sounds as cute as she looks saying this. But, this brings up the crux of the matter: that’s not actually what the pen writing in black in the first image says. It actually says, “itsudemo kanou”, that is, 可能 (かのう), composed of “can” and “ability”. It’s usually read as “possible” or “feasible”. In other words, her father was conveying that he could make it to the open classroom “anytime”. In other words, he wouldn’t allow work to drown out his relationship with his daughter any further. Why didn’t Nanako read it that way? Ah, well that’s because the kanji was above her reading level. So she used nanika (何か、なにか) instead. The kanji used in “nanika” (and there’s only one) is the kanji used for “what” types of questions. The “ka” is the “question” particle that every young Padawan learning Japanese has drilled into his/ her head from the earliest stages; the particle acts as a question mark in grammar. The problem is, this isn’t grammar; it’s vocabulary. Here, I’ll show you a subtly different use. In the above example, the “ka” in “nanika” represents uncertainty. In other words, it’s not a simple “What?” question; it’s expressing a thought more like, “What is this…?”. In other words, “nanika” expresses that the speaker doesn’t know what the “what” actually is. Therefore, nanika = “something”, as in, “something or other”. 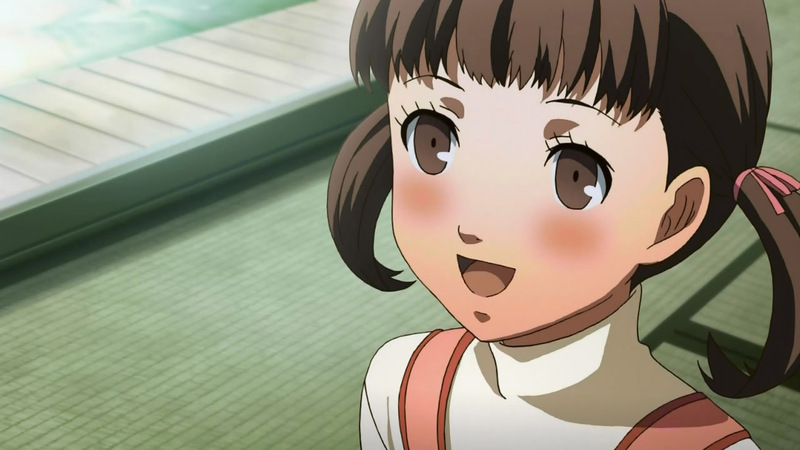 Let’s go back to Nanako. That’s what it means. Of course, it just happens to sound ten times cuter in Japanese with Nanako saying “nanika” instead… because it’s adorable that she can’t actually read it yet; it underlines how young she is. I’m paraphrasing; I don’t have the episode handy, but he explains what it means in language she can understand. This is followed by the happy Nanako celebrating and being glad she can be seen with her father in front of other students and their parents and not feel left out anymore. This entry was posted in Japanese, Languages and tagged classroom, itsudemo, Japan, languages, learn, Nanako, nanika, nihongo, persona 4, school. Bookmark the permalink.